Chapter 5 - Two Is Not Better Then One. Taillus wakes up to the sound of someone trying to gain access to the top of the guard tower. He rolls over as he opens his eyes before frantically scooting over to sit on the hatch. He can hear the annoyed grumbles of an Imperial Legion guard as he knocks on the wooden hatch. �By the gods if you do not let me up there intruder we will go outside and ventilate you with a volley of arrows!� An angry imperial shouts as he raps on the door impatiently. Taillus bites his lip as he looks at the hatch between his legs. He quickly thinks about his best course of action. The tower is quite high, but he has had really good luck with falling and not breaking any bones. He could scale the wall like he did on the lighthouse in Seyda Neen, but the surface of this tower seems much more smooth and he would probably land on his face anyhow. Not to mention he runs the risk of being caught. �You could kill him my boy. One solitary guard is no match for my harvester of souls! Use the Mace that I have entrusted in you to rearrange that mouthy guard�s facial features. It will get you started on my army of souls!� The evil Molag Bal whispers in Taillus� head. �Do you not have any godly duties you should be concerning yourself with? I agreed to your demands but you did not tell me when I had to start.� Taillus growls as he looks again at the wooden hatch. The guard begins chipping away at it with his sword making Taillus panic. Suddenly it comes to Taillus as if he had read it in a book of things to do in a situation such as this. Taillus clears his throat and kneels on the hatch, lowering his face to the wooden surface so that the guard below can hear him better. �Could you leave me to my job my imperial friend?� Taillus shouts at the hatch trying to get the attention of the guard. �I have been paid to clean the leaves and rain water out up here and I cannot do my job when I have guards threatening my life!� Taillus shouts again. He can hear some guards below him conversing quietly with one another and he looks down between his legs hoping that they fell for it. �Terribly sorry friend. I will leave you to your business but hurry and be on your way.� The guard says as Taillus can hear him descend the wooden ladder and walk away. Taillus has to cover his mouth to contain his laughter as he gathers his things and opens the latch with his foot. Taillus finds himself once again in the bustling city of Balmora. It seemed that the people had forgotten about his little spat with Molag Bal in the streets yesterday and he decided to check out the local merchants. Taillus was slowly coming to terms that he was the official property of a Daedric prince. He realized that he had very little choice in the matter and that he would eventually have to get better at fighting. He would have to find someone that could teach him the ways of the sword and he was going to have to pick up some armor to aid him on his quest. �I don�t even know how to be a killing machine. I am just getting over my fear of Bonemold armor for crying out loud! This has to be some sort of mistake, I can�t be the ambassador for Morrowind and there is no way that I can kill for a Daedric Prince.� Taillus whispers to himself as he treads through the streets of Balmora. He looks at the civilians as he passes them by, shaking his head at their ignorance. �They have no idea that I am the right-hand man to Molag Bal. How could they? But here I am, the man fated to kill everyone I see all in the name of the Daedra, standing in the middle of a busy town. The sheer idea of it is nonsense! There must be a small chance that I still have the Ash Chancre disease like Jiub said.� Taillus rants as he scans the shop signs for a place he could buy a modest set of armor. After a day of shopping, bartering, trading and all other sorts of mercantilism, Taillus walked to the closest inn he could find sporting bits and pieces of various armor types, mostly iron but also some steel to make up the difference. He also picked up a steel long sword just in case Molag Bal�s mace wasn�t his cup of tea. Taillus dumps his armor and weapons at the foot of his bed and plops himself down staring at the ceiling. He was quite tired indeed and not because of all of his shopping. It seemed that all of the events making up the past few nights had caught up with him once and for all. It was nice knowing that he was going to be able to get a solid few nights rest and not have to worry about what will hurt when he wakes up. �Resting is for the weak my young ambassador. There are many things you must do and we do not have very much time! We need to train you and condition your body for the power you will so very soon have coursing through your veins. We need to make you blood thirsty and full of rage. I suggest that to get you in the killing mood we track down your old friend. Jiub has yet to leave this town. He is busy selling your armor and making himself a profit from your suspected death. He would be a wonderful start and I would enjoy torturing his soul for you.� Molag Bal whispers. �Do you not knock before going up there?� Taillus says as he grips his head and lies back on his pillow. �My patience is wearing thin boy! I will only allow you to procrastinate for a small while longer. It would be nothing at all for me to set loose those two Daedroths at your door and they will make short work of you. I need souls to fuel me and I am growing impatient!� Molag booms as Taillus grips his head hard and writhes on the bed. �You WILL journey to Vivec upon the rise of the sun and you WILL join the arena. You WILL train yourself to become a better fighter and gain some much needed experience. Once you become the champion, I will give you direction on my orders from there! I will not tolerate disobedience any longer and this will let you know how serious I am!� Molag shouts from within Taillus� brain again. �Great now I have a demon threatening me! I am really beginning to hate Morrowind. I better get suited up just in case he isn�t bluffing. I don�t exactly feel like being a stain on this wall tonight.� Taillus sighs as he looks down at the foot of his bed at his modest armor. �As if this garbage could keep me alive. I really need to hit a streak of good luck sometime soon.� Taillus growls as he sits up straight. Taillus rolls off his bed and begins piecing his armor together. He quickly suits up as he looks to the door. A loud bang can be heard from the other side as the wooden door cracks down the middle from the power of what was coming for him. �I do not like the sound of this. What has Molag Bal sent to knock at my door?� Taillus wonders as he quickly snaps together most of his armor in case he is greeted by a flame antronach or something equally dangerous. Standing on the other side was a drooling, growling Daedroth and it struggled to get inside Taillus� room. He hops back on his bed with the steel sword in hand as the crocodile headed monster tears the wall gaining access to Taillus who is trembling in fear. Patrons of the pub that was located downstairs begin to scream in horror as well as the other people with rented rooms. Taillus bats the invading claws of the Daedroth as it backs him to the wall. �This is madness. I can�t kill this monster!� Taillus thinks to himself as he ducks and weaves the snapping mouth and lethal claws of the scaly green beast. It manages to trap Taillus with his back to the wall and frantically swings its deadly, razor sharp claws at our hero�s upper body. The daedroth eventually manages to get in a solid swipe as it peels through the steel chest plate strapped to Taillus. Taillus clenches his sword tight as he can feel the claws tear through his shirt as well as flesh beneath the armor of his chest Piece. Taillus yells in pain as the Daedroth rips its claws from his chest, licking its glimmering teeth in hopes it can feast. Taillus� sight begins to weaken as the massive wound overrides his brain. The pain numbs his entire body and he fights to remain standing. Taillus watches as the beast takes another deadly swing but misses as Taillus falls into the clothes dresser beside him. He holds on to it to prevent falling down as the Daedroth opens its mouth in hopes of finishing Taillus off. With the last ounce of remaining strength he has in him, Taillus swings his sword behind him in a desperate attempt to injure the beast, allowing him enough time to get his back away from the wall. A small smile crosses his face as he can feel the metal of his long sword collide with the Daedroth�s mouth. The monster hisses in pain as it shakes its head. Taillus turns quickly and falls onto his bed. He rolls over facing the ceiling and reaches down to grab his mace. The wound on his chest leaves a puddle of blood on the clean white sheets and Taillus blinks hard, shaking his head hoping he doesn�t black out. The pain in his abdomen is unbearable as he clenches both the blade and the mace with every thing he has. The Daedroth quickly closes in for another chomp but is met with the business end of the Mace of Molag Bal. The monster�s head is shaken as the sound of breaking bone can be heard. The mace pulsates with a red energy as it flows into Taillus� body. Taillus breathes hard as he can feel his every muscle revive. His pulse quickens and his heart pounds against his ribs. Taillus hops to his feet and swings the mace at the Daedroth�s skull once again, this time sending the large beast headlong into the wall beside it. Taillus looks as the mace pulsates once again before sending another charge of energy into his body. His muscles flex hard before increasing in bulk and Taillus feels as though he could lift an Orgrim over his head. �I will not die here today Molag Bal. Nothing can kill me! Your pathetic pet lizard will fall before my feet along with everyone else that stands before me! You want souls? I will start by giving this pathetic one back!� Taillus yells as he buries the blade of his long sword into the belly of the Daedroth. The demon roars as a thick blackish red blood seeps from the large wound in its belly. Taillus pulls the long sword up and out of the monster, leaving a deep cut ending just at its battered jaw. He looks down as the beast begins to fizzle, eventually leaving nothing but a bleeding Daedra heart on the floor by his now broken bed. �If I am your vessel then why did you send something to dispatch me? You must be rooting for my survival or else you will not get your souls.� Taillus says as he sits on what is left of his bed, looking at the floor. �If you could not dispose of one of my minions then I would have no need for you. But now you know that I mean business and I have many ways to keep certain that you will remain highly motivated to do your duties. Now do whatever it is that you mortals do and waste some time closing your eyes. The sun will be up soon and you will be soon on your way to Vivec to partake in their arena competition. This will condition you for what is to come.� Molag whispers in Taillus� head once more as Taillus drops his bloody weapons and sits on his broken bed. He lays awake for the rest of the night, staring at the torn and splintered wall leading to his room and realized that eventually someone would be in to visit him wondering about how he or she will be compensated for the damages done. Ay, Molag Bal is getting restless. Taillus will need to drag himself together and become the ultimate evil before he is swamped by Daedroths. Nice piece again, it really makes me wonder how he'll deal at the arena. He thinks to himself about how the ambush ended. How the tide of battle quickly went to his advantage. It seems that he was far luckier then he had originally thought. Maybe all of this conflict is just what he needs to become the warrior he needs to be. Be that as it may, Taillus was beginning to feel the stress of everything that had happened up to this point and as he lets his head fall on his pillow, his eyes close seconds after. Taillus awakens the next morning to the sound of someone rapping on what is left of his door. He sits up while rubbing his eyes to see a large Nordic Man with his arms crossed. Taillus could tell that he was here to discuss payment for the damage done to the Inn and to be honest, Taillus was thinking of starting his harvest. Taillus stretches and yawns loudly, wishing his slumber would have not been interrupted. It was one night where he hadn�t had dreams, or woke up in complete pain. He looked at his mangled chest piece and noticed that his wound had healed. From what he could tell, it was due to Molag Bal�s mace. It seemed that every time it rattled against his opponents, it stole the very life essence from them and loaned it to Taillus. When he swung it at that Daedroth, he could no longer feel the sting of his wound, and he was then able to send the huge demon into the wall with his next swing. Taillus began to realize the power of the artifact entrusted in him and knew that he would have to keep it from falling out of his possession. His continued to marvel over the power of the mace until the rapping on his door was replaced by the rude ramblings of the large Nord. �I hope you know that repairing this damage will not come very cheap.� The Nordic man says in a very deep voice while assessing how severe it truly was. Taillus gets off the bed and to his feet. He looks to the floor at the Daedric heart that was left by the daedric demon. If there was any conflict from this oaf, it surely wouldn�t be as life threatening as that Daedra so Taillus looks to the Nord with a new confidence. �I don�t know if your limited intelligence made this clear to you but I was attacked by a Daedric demon last night. It is not like I was gallivanting around with my mace renovating the place!� Taillus hisses as he gathers his belongings. The nord, who was at this point very offended by our Imperial friend, reaches down to Taillus and grips him by the shoulder. Taillus could feel the enormous hand consuming his shoulder as he looks behind him to see the angry Nord. �I don� want to have to make an example of you my friend but unless you show some gold to pay for my Inn I will have to grind your bones.� The Nord says as he grips Taillus� shoulder much harder. �I am in a hurry you gigantic oaf and I greatly suggest that you remove your hand from my person before you wind up like your wall.� Taillus growls as he can feel the Nord grip harder. The Nord sighs impatiently as he had probably seen this happen before. Perhaps not at this caliber but he probably has been through similar many times before. �I would have been willing to let you work off this damage to repay me but I have had a change of heart. Now you will have to answer to Vlad the Iron Bear!� The nord shouts as he draws a large Nordic broad sword. �Great! Can I not go mere minutes without having to fight something or someone? This is going to be a long and tiring road if this is going to be the trend. But I guess this is all to become the ambassador for Molag Bal.� Taillus thinks to himself as he watches the Nord. Taillus laughs to himself over the name but wishes to refrain from further insulting this large man. Truth be told, Taillus knew he could down this poor soul but didn�t quite feel like unnecessarily fighting his way out of Balmora. He decided that it would be best if he could just easily outsmart him and be on his way. He even felt bad for the Nord too. Here was a man just trying to make a simple living providing a place to stay for weary travelers. He did not wish for one of his rooms to be ransacked by a crazy imperial and his �imaginary� friend. �I am terribly sorry my good friend but the same as you and your shop had a rough night, let us not forget about me being the one who actually ended the life of the Daedroth that was terrorizing this place. I put my life on the line to save you and your patrons. Is this not enough repayment?� Taillus asks, looking at the Nord. The large man thinks for longer then Taillus would have hoped. There was a certain level of urgency when a god of sorts is angry with you. A type of urgency that makes people want to be on their way to avoid lots of wrath. Finally, the Nord speaks up. �Aye, it was a mighty fine job you did here my boy, I guess I should be thankful considering that dreaded beast didn�t eat me or any of my customers. I thank you for your might. You have the courage of a true Nord. What is your name friend?� The now pal of a Nord asks. After hearing Taillus� name, the Nord reverts back to his thinking state, unaware that Taillus is really tried for time and desperately has to get to Vivec. The Nord�s face eventually lights up like a paper lantern and he clears his throat. �I hereby name you Taillus Alpha wolf for your bravery and courage to defend this inn from the evils of the Daedra!� Vlad shouts as he beats his chest with one arm proudly. �Kill him Taillus, Killing a man of such stunted intelligence is not a crime, it is a favor. Please do it for everyone. You will be a local hero. Kill this Nord before he makes me vomit!� Molag shouts from within Taillus� head. Taillus thanks the Nord with good intentions and leaves the inn. He nods accepting invitation to return for some mead and practically sprints from Balmora. �I am getting a bit upset Taillus how you continue to ignore me and my biddings! I will not tolerate this for too much longer.� Molag Bal growls as Taillus jogs through the streets. Taillus grinds his teeth together as he walks, trying to ignore the voice in his head. He hoped to get all the way to Vivec without someone thinking that he is completely mad from talking to himself. He quickly jogs up the steps leading to the local Silt Strider and up to the awaiting dunmer ticket person and hands her a few gold coins. The dark elf woman looks at the coins before looking at Taillus with a scowl on her face. �Hurry up and make this ugly beast take me to Vivec.� Taillus growls as he walks past her and looks down at the hideous creature known as a Silt Strider. He cannot believe that he is about to get up close and personal with something this nauseating but knows that it would be better then walking and angering the voice in his head. He realizes that he was overly rude with the Strider pilot but could not help his mood due to a splitting headache that he was getting from having Molag Bal in his head all the time. The Strider Pilot shakes her head and climbs onto the beast before confirming in a monotone voice about the next destination being Vivec. Taillus holds on for dear life as the strider leaves its dock of sorts and begins coasting out of Balmora. �I should send an army of Daedroths to rip the meat off of your bones you sad and pathetic weakling. One dim-witted Nord and you couldn�t even crush his skull. I know that mortal emotions can get in the way but I am beginning to think that I should be done with you and look to another ambassador. Your fried Jiub would be plenty blood thirsty.� Molag Bal states as Taillus shakes his head in a feeble attempt to remove the voice. �I am giving you one final chance to prove yourself to me Taillus. If you do not end the lives of everyone you face in that arena I will be sure to have someone take your place. Do you hear me you insignificant speck!� Molag Shouts from within the confines of Taillus� brain. �Shut up, shut up! I will do as you ask of me but please just shut up!� Taillus shouts as he grips his head. Luckily the pilot was the only one around and she was quite focused on doing her job. Taillus can feel his head pound from the constant stress of having another entity share his mind. As Taillus finds himself in Vivec just a short time later, he decides it would be wise to not do a lot of sight seeing and just get down to business. He quickly checks through the various merchants and trainers of the Foreign Quarter to repair and reinforce his armor as well as to learn a few much needed spells. He was going to have to learn as much as possible in order to stay alive over the next few weeks. Taillus heads to the Arena Canton in Vivec to register himself for the competition and to pay his fee. He was beginning to feel much better about his situation. He had seen the mace of Molag Bal in action and from what he could tell, used an enchantment to mend wounds and give a second wind as well as being able to steal the very essence of strength from his foes. He was also feeling much more confident due to his success with the daedroth and the Nord back in Balmora. It seemed that somewhere deep inside him, he really did know how to fight. He was impressed as to how he reacted under stress and with training, he began to think that he could be a very good soul farmer. Taillus learned that his first match would be in only a few days but they could not release any information on his opponent. This would make things interesting and he had to be sure he would be ready for anything. Taillus found himself underneath the Arena looking at the various animal cages and training corners. A few men were shining their armor and making sure all of their equipment was in working order. Taillus locks his belongings in a cubby with his number etched into it and sits on the floor watching some people on the training mat spar with their trainers. Taillus looks as one man, a redguard finishes his spar and leaves the training mat to take a break. He spots Taillus and takes a seat beside him. He was dressed in thick studded leather armor and had various blades strapped to his person. He looked to be very well seasoned in battle and he could probably pick up a few tips. �Hello Imperial, you look to be quite lost here. You must be quite new to the game. My name is Cerwin but you can call me Vanguard. Everyone else here does. So what brings you to the Arena?� Cerwin asks. Taillus smiles, as if he was going to disclose the reason for him coming here. That would be a sure fire way to make a bunch of friends. He simply looks over to the Redguard and fabricates a huge lie. �I am here to earn enough to hopefully cure my younger sister of her ailment.� He says while acting emotional. The redguard must have fallen for it because he opened up and began telling Taillus what to look out for in the Arena. �Well it is very brave of you to do this for your sister my friend, one thing you must be aware of is that many of these men have been doing this for a very long time. There are two ways you can win. One is to kill your opponent, the other is to make them submit. I do not recommend the second method. The way I see it, if you let your adversary leave, they will learn from your fight and kill you next time.� The Redguard states as he slowly gets to his feet. �I wish you luck my friend. I will be watching you. I suggest you come upstairs and watch a few battles yourself. It will give you some insight on what you are up against.� Vanguard says as he heads out of view. It seemed like a good idea to watch the next few battles Taillus thought. Hopefully it wouldn�t scare him out of fighting. He couldn�t stand to be yelled at again by Molag Bal. Now our little Daedra friend is really getting impatient, isn't he? Great work. Now we can all look forward to some arena glory. Sorry for not commenting on Chapter 4. RL has gotten insane, and I'm having a lot of trouble keeping up with all the prolific writers at W4O. Your recent updates have been great. I'm enjoying the give-and-take between Taillus and Molag Bal, but I am surprised at how much leeway (sp?) Molag Bal is granting. He must really need a mortal to perform this task, or he wouldn't put up with this. I am definitely looking forward to seeing how Taillus fares in the arena. No worries Planty, I had just thought everyone had lost interest in poor little Taillus. And I did realize about halfway through that Molag was giving our Imperial friend way too much give but things soon change. To justify it, Molag Bal sees GREAT potential in Taillus and thus allows him a small bit of leeway, but expect a shorter leash in the not too distant future. Chapter 6 is completed (How the time has flown) and will be up by tomorrow afternoon. I hope everyone is still vaguely interested and thanks for everyone's support up to this point. I certainly haven't lost interest in Taillus. 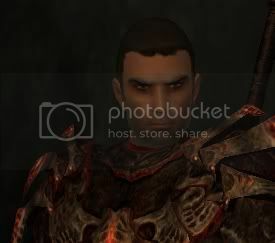 I love the guy, even though he has a Daedra in his head. I can't wait till chapter 6. How do you manage to write that fast? Painfully... That's how Naw, I just work on it while I am at work so I technically get paid to! I work at a kiosk in a mall and when I am not selling things I work on Taillus' story. Terribly sorry Tellie I get so caught up in telling the story that I just add posts like mad. I know all about RL getting in the way of things (considering I almost had to abandon my story) But I am going to ease up on the posting for a while and let everyone catch up. But Chapter 6 is ready and # 7 will be soon. Thanks for the continued support everyone!